Pat S., 2009 Squiggy Classic Time Trial. 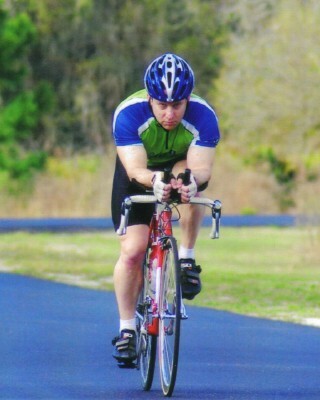 11 Apr 2009 - Osceola Velo Club's Pat Schlager was on hand for the truely one-of-a-kind Webster-Roubaix Road Race held on the rual roads near Webster, FL. What makes this race so unique is the 2.5 km of unpaved roadway each 15 km lap. That and the distances -- the Pro/1/2 category raced for a grueling 180 km. Fortunately for Pat S., the combined Cat 3/4 race in which he participated raced for a mere 105 km, which meant "only" 7 times over the unforgiving "hard packed dirt road" (as per the race flyer). In reality, the final 1 km of the unpaved section was anything but "hard packed" with racers skidding and sliding left and right as they tried to negotiate the soft sandy surface. 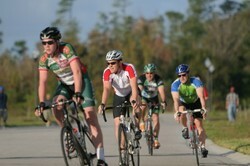 Pat put in a gallant effort, stayed upright (barely, at times), and ended up finishing 26th out of the Cat 4's which earned him 10 points in the season-long Florida Points Series (FPS) as well as in the Florida Cup Series, a subdivision of the FPS reserved for the "epic" Florida races. That makes a grand total of 22 FPS points for Pat so far in 2009! 14 Mar 2009 - Osceola Velo Club's Pat Schlager continued his successful 2009 Florida Points Series (FPS) season with a great performance/result at the Squiggy Classic Time Trial held in the Flatwoods Park near Thonotasasa, FL. The individual "Race of Truth" took place on a flat meandering 7-mile looped roadway in the scenic park. Pat's average speed of 23.0 mph, his fastest time trial in over a decade, was good enough for 14th place in the Men's Cat 4 race and earned Pat 6 more FPS points for a season total of 12 points. Way to go, Pat! 31 Jan 2009 - Osceola Velo Club's Pat Schlager and Dave Zak lined up for the Men's Cat 4 race at the Spring Fling of Cycling Circuit Race, the first race of the 2009 Florida Points Series (FPS), held in very chilly and windy conditions near the DeLand Airport in DeLand, FL. Pat S. and Dave Z. took their customary positions near the back of the peloton in order to keep out of the wind and keep an eye on the unfolding race. The main field stayed pretty much all together for most of the 40-minute-plus-2-lap race around the 1.44-mile circiut thanks mainly to the strong winds. 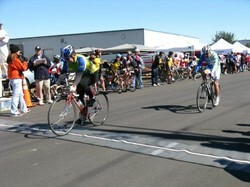 At about the 33-minute mark, the hammer dropped which strung out the peloton as it sped along at 30 mph. Pat gritted his teeth, put his head down, and gave it all he had in order to hang on to the main field as others, unfortunately Dave included, were tailed off the back. The pace eased for a bit before increasing once again with two laps to go. Two crashes during the second half of the final lap prevented Pat from moving up to contest any sort of sprint finish, but Pat crossed the line upright and safe in 23rd place, thus earning him 3 FPS points. Superb opening race, both in terms of performance and results, of the 2009 season, team! 10 Jan 2009 - Osceola Velo Club's Pat Schlager and Dave Zak lined up for the Drew Landing Training Criterium held in hilly Lake County, FL just south of Clermont. A huge field of 55 riders rolled out in the chilly, early morning weather for the B-race. Pat S. and Dave Z. rode near the back of the peloton keeping an eye out for those pesky crashes that always happen when one gets this many racers together this early in the year. The expected crash occured at about the race's mid point with both Pat and Dave using their experience (luck?) to avoid the fallen and swerving riders to stay upright and continue unharmed. But by this point, Pat was at his limit and faded from the reduced peloton while Dave was able to hang on to the main field until the end. Great improvement in performance, Pat and Dave! Check out the photos. 27 Dec 2008 - The 2009 Central Florida road racing pre-season has officially arrived with the Armada Training Criterium held in eastern Orlando, FL. Pat Schlager represented the Osceola Velo Club at the crit and fared quite well, thus demonstrating a successful off-season training program. Despite absolutely no warm-up ("too cold out there"), Pat S. was able to ride "comfortably" at/near the back of the B-race peloton for the entire race, even closing gaps left by struggling riders with relative ease. Even better, Pat was able to avoid the inevitable crashes one expects in these training races and rolled across the line upright for a top-15 finish. Promising start to the 2009 pre-season, Pat! Check out the photos. 29 Nov 2008 - The racing members of the Osceola Velo Club are in their mid off-season training phase preparing for the fastly approaching pre-season training races here in Central Florida. Training in this phase consists of continuing with general strength training in the gym and maintaining aerobic endurance on the bike, but now with the addition of high intensity interval training on the road to increase one's VO2. With the pre-season starting in late December, a week earlier than usual, this is no time to be lazy. Stay tuned for more updates and race results. Pat S. crossing the line in 23rd! Pat S. rolling on home upright and safe.